This is a charming, cartoonish and really entertaining Microgaming’s slot with a multi-tiered bonus feature, amazing animations and a funny storyline. The slot is played over 5 reels and 20 fixed paylines. The bets can be made anywhere between $0.2 and $50, with all win lines enabled. Apart from playing card icons, the symbols fit the Greek mythology theme and include Hades the god of the Underworld, Medusa, Zeus and Poseidon – all designed in a tongue-in-cheek manner. Alongside with wilds, scatters, Sticky Wilds and a massive 5000-coin jackpot, the slot features a brilliant 5-level Quest for the Crystal Helm. Your task is to pass through all locations and get back a legendary Helm. If you make it to the final stage, you can claim a huge prize worth x250 times your total wager. 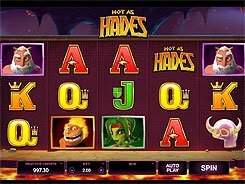 It will not be an understatement to say that Hot as Hades is one the most impressive and visually rich slots released by Microgaming ever. Having versatile betting options, the game will catch the fancy of all slot aficionados, whether you are a beginner or a veteran.